Lisa Markham of Cuisine en Locale serves Poulet in Pot to Nick Diamond of Somerville. Green salad with honeycomb, roast beef, and African blue basil. Sarah Peterson and her bees. The “beard” on Sarah Paterson’s chin and neck was made up of gently buzzing, quivering bees, which had crawled from a pizza box held by Peterson and then surrounded a caged queen bee hanging from her neck. This exhibition in Somerville last month brought immediate attention to Paterson, a performance artist who wasn’t stung by the bees, which are docile outside their hive. It also was part of a broader effort to bring once invisible neighborhood beekeepers and their valuable honey to center stage. 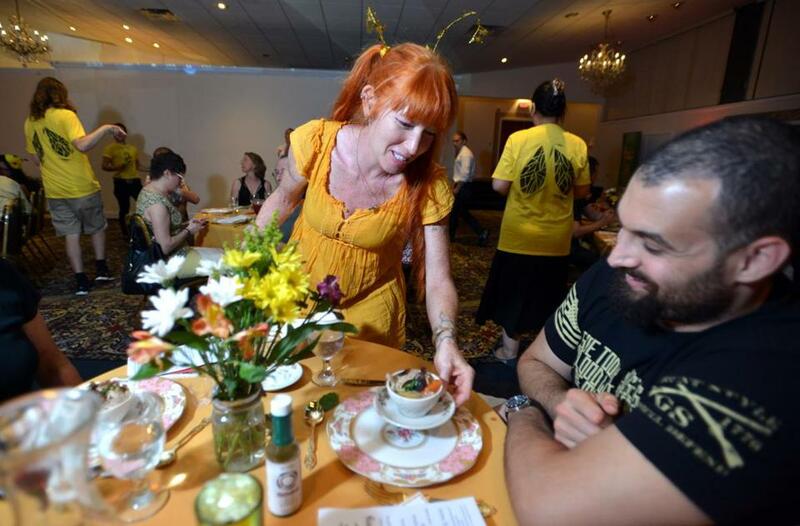 The event, called Follow the Honey, served up a 10-course meal that featured honey and hives in everything from appetizers to desserts. The state’s beekeepers, like their counterparts around the world, are searching for ways to expand their market after a worldwide disease decimated hives. And they’re riding a culinary wave of honey being substituted for other sweeteners for taste and health reasons. The increasing use of honey is part of the farm-to-table movement and consumers’ interest in probiotics, so-called superfoods, and food as medicine, said Florida-based restaurant consultant Aaron Allen. The shift from sugar to honey is comparable to the shift from butter to olive oil, said Allen, who also described honey as an alternative to highly processed foods. Chris Delaney’s recipe for pulled barbecue chicken. Cooking with honey is more advanced in major metropolitan areas, as well as liberal markets in the Northeast, Calfornia, Oregon, and Austin, Allen said. But he expects the trend to spread, eventually reaching even fast-food outlets. Essex County has about 600 beekeepers, estimated Anita Deeley, the county’s bee inspector. These beekeepers, like their more than 4,000 counterparts around the state, are accustomed to finding creative ways to use their honey, simply because they harvest so much of it. Jane and Robbie Wild of West Newbury have been keeping bees for 23 years. They harvest 300 pounds of honey a year from their six hives, and Jane started cooking with honey to use the surplus. These days, she has a bottling tank that keeps 200 pounds of honey warm 24/7 for all her cooking needs. Wild said she uses honey in “everything” — sauces, desserts, vegetables, granola, yogurt, and cookies — and has seen non-beekeepers using honey in more dishes. She also has seen fruit syrups created from honey for seltzer or cocktails. Like other beekeepers, the Wilds are gourmets when it comes to their honey. Some separate their honey into batches, according to where the bees collected the nectar. Jane Wild, for example, has observed her bees visiting apple blossoms, wildflowers, hostas, purple loose-strife, linden, and catalpa. The general public, accustomed to store-bought Midwestern clover honey, now is discovering what local beekeepers have long known about variations in flavor. Honeybees are a lot like chefs, collecting a little more of this nectar and a little less of that, depending on the weather, proximity to the hive, and intensity of the nectar flow. As a general rule, bees in Massachusetts produce a light-colored spring honey with subtle flavoring because the flowers blooming at that time produce light nectar. As fall approaches, the nectar is darker, as in goldenrod or purple loosestrife honey. That produces late summer and fall honeys that are bold, complex, and full of flavonoids (antioxidants). Chris and Peter Delaney have kept bees for 26 years on their Boxford farm, where they also raise chickens and various crops. Their nine hives produce 300 pounds of honey a year, with one- third of that used for cooking. “The honey adds a nice flavor, compared with sugar,” Chris Delaney said. She favors dark honey like buckwheat and purple loose-strife when she bakes bread, and light honey for salad dressing and sugar cookies. She also uses dark honey for a tasty BBQ sauce for pulled chicken and pork. Delaney has copied honey-based dishes from restaurants she has dined at, but points out that you don’t need to be a fancy chef to create a honey-based dish. Her simplest dish is a scoop of vanilla ice cream with honey drizzled over it. As a beekeeper myself, I couldn’t resist buying a ticket to the Somerville event, which was co-sponsored by Follow the Honey, a honey-oriented store in Cambridge; catering company Cuisine en Locale; Soon Spoon, a web-based service that helps diners find restaurants; and Green River Ambrosia, which produces honey wines. At the wildly creative 10-course honey and hive dinner, prepared by Cuisine en Locale, 10 beekeepers from around the state were represented. Among those contributing was Rick Reault of Tyngsborough, president of the Massachusetts Beekeepers Association and owner of hives around the state. Reault’s honey was used for pork shoulder arepas with cilantro — pulled pork with vinegary-sweet overtones, served on a well-browned corn pancake. Other choices ranged from sopapillas dipped in honey; lobster with bee pollen, vanilla butter, and calamintha (a mint-like plant) over fresh creamy corn and peas; green salad with roast beef, African blue basil and honeycomb; cucumber-blueberry sorbet with basil; and Moroccan-style lamb ribs with spices, honey, and calamintha. The flavors of the 10 dishes were sometimes familiar and sometimes exotic. The various honeys imparted a touch of sweetness and complexity, but did not overpower the dishes. If you missed that dinner, you can still see some imaginative honey-based creations at the Topsfield Fair, which runs the first half of October. This year’s fair will again include a contest for cooking with honey. Desserts are the most popular entries in that category, said Jane Wild, who heads the honey-cooking committee, but people also have been submitting honey-based pickles, BBQ sauces, and ketchups. And good news! The number of kids entering the contests is growing. north to see more photos from the Follow the Honey dinner.